Mixture of PU BINDER 1178(1 kg/m2/cm) and RECYCLED RUBBER 858, SBR granules (6 kg/m2/cm) in granulometry of 0.5-2mm. Innovative, elastic, seamless, flexible colored flooring, ideal for playground floorings. It consists of a cushion base, with a first layer of a prefabricated, special, safety pad for playground flooring, RAPIDFOAM 868, followed by a layer of PU PRIMER 870 with polyester net, and third layer a mixture of RECYCLED RUBBER 858, SBR granules (granulometry 0.5-2mm) with PU BINDER 1178 in thickness of 15mm. Then follows the modified sealing, sandproof and waterproof KDF-PU 1055 pore filler with high elasticity in 2 crossing layers and the modified, KDF-PU 1056, sealing, UV-resistant, aliphatic, elastic, glossy top layer in 3 crossing layers. It provides an excellent safety flooring with a very quick application in a variety of colors and closed pores. 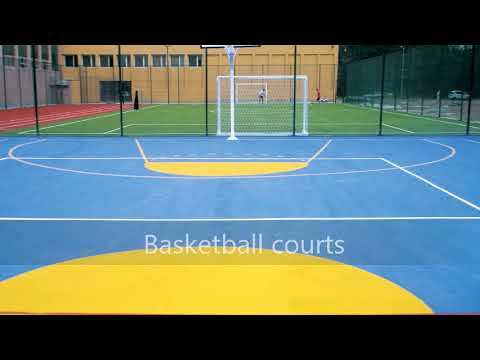 Playground flooring that is easy to be cleaned and maintained. 1.RAPIDFOAM 868 - Prefabricated special safety pad for playground floorings. 2.PU PRIMER 870 - Special, polyurethane primer with a polyester net. 3.Mixture of PU BINDER 1178 and SBR granules in granulometry of 0.5-2mm. Applied by flat metal trowel after spreading and leveling with rake and straightedge. Rolling with cylinder follows for compacting. 4.KDF-PU 1055 - Polyurethane, modified, sandproof and waterproof, elastic pore filler. Applied by metal trowels to create a completely non porous surface. 5.KDF-PU 1056 - Polyurethane, modified, UV-resistant, aliphatic, elastic, glossy, two-component top coating.